Here are some images I took this past week at the OzSky Star Safari near Coonabarabran, Australia. 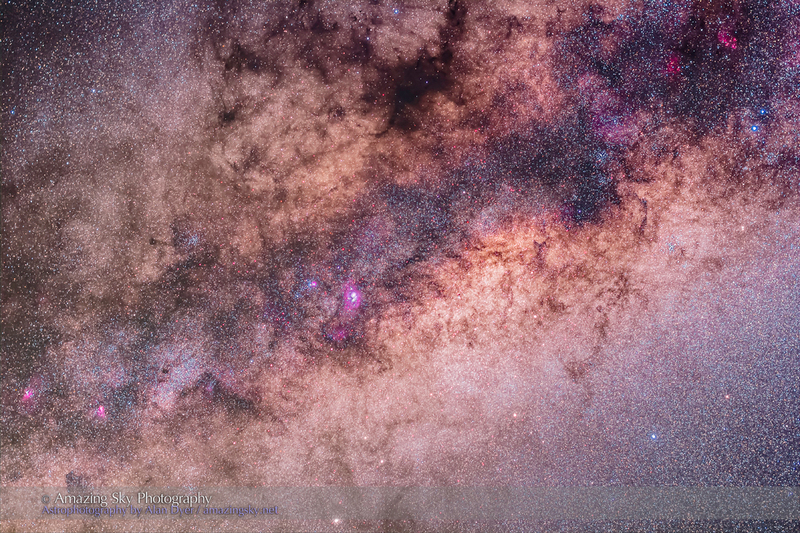 The lead image above is a wide-angle lens image of all of Scorpius (above and to the right) and Sagittarius (below and to the left) straddling the Milky Way and its bright glowing core. The direction of the galactic centre is just left of centre of the image. We can’t see the actual centre of the Milky Way with our eyes and normal cameras because there are just too many stars and obscuring dust lanes in between us and the core. 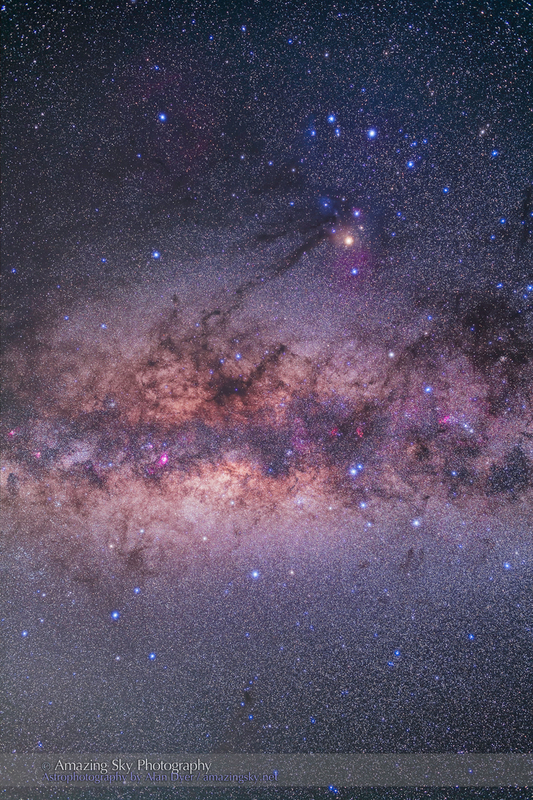 The dust forms marvellous patterns across the glowing Milky Way — see the Dark Horse prancing at left? Long tendrils of dust reach from the feet of the Horse to the bright yellow star at top, Antares, the heart of Scorpius. This image with a longer lens zooms in closer to the bright Sagittarius Starcloud around the heart of the Galaxy. All along it you can see red and pink nebulas, from the Cat’s Paw at upper right to the Eagle Nebula at lower left. The larger pink object at centre is the Lagoon Nebula. The next image zooms into the area at the centre of the above shot, just right of the Lagoon. This is the star-packed Sagittarius Starcloud. Everything you see is stars. Millions of stars. 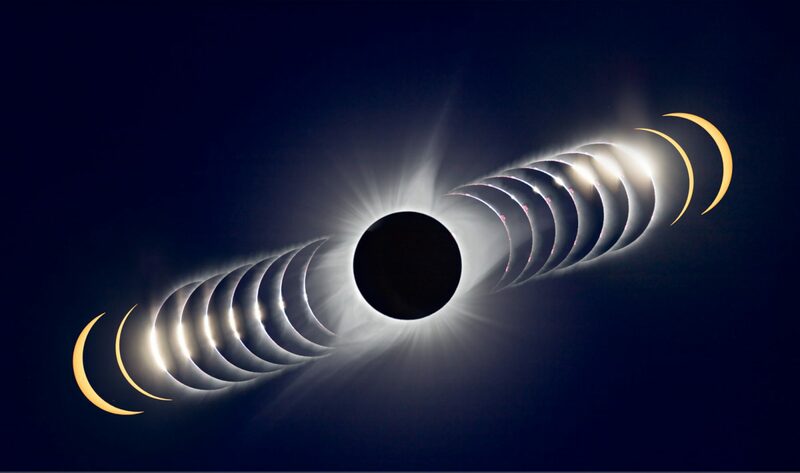 I took this shot with a 300mm telephoto — a small telescope actually, the gear shown below. It’s what I was using most of this past week to shoot the Australian southern sky. This is some of my Oz gear, the equipment (except for the camera and autoguider on top) that stays in Australia for use every year or two. 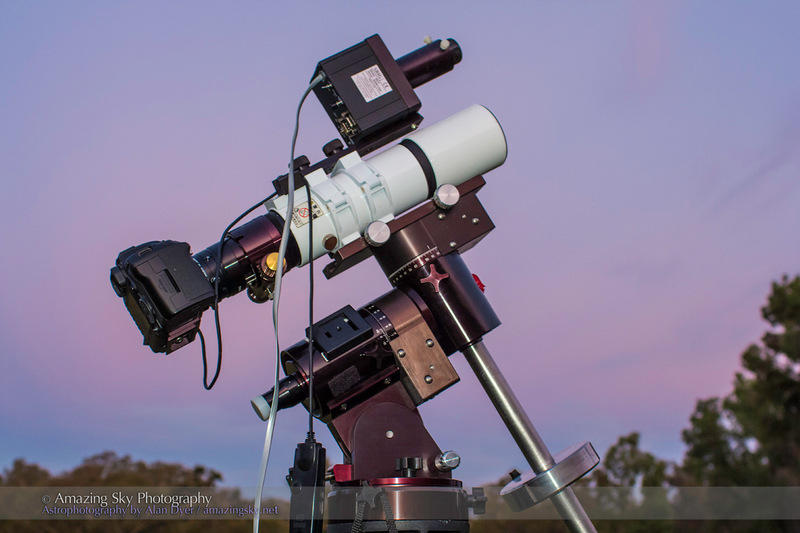 The mount is an Astro-Physics 400 and the scope is the Borg 77mm f/4 astrograph. I used it for the close-up photo. The gear all worked great this time. I’ll have more photos to post shortly as my connection allows. Tonight, I am at the Parkes Radio Observatory where the internet connection is as good as it gets! 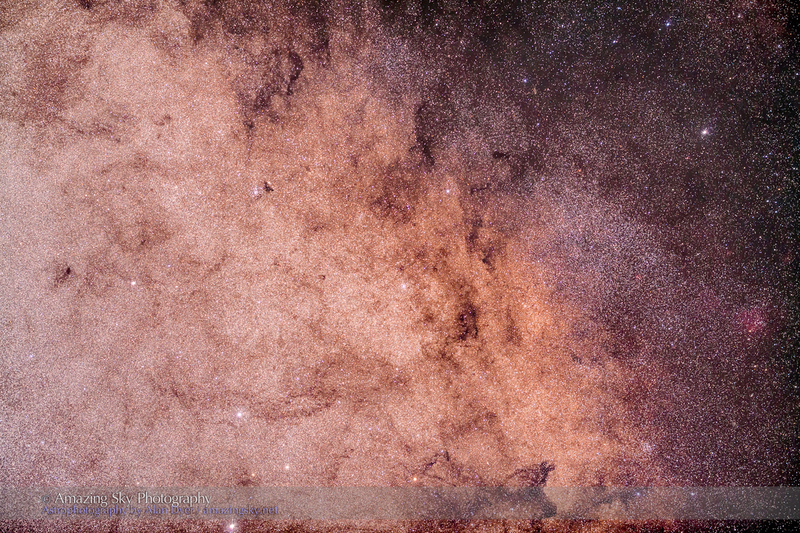 These 3 photos, together with your earlier 360-degree panorama, make a superb “zoom sequence” of 4 photos — from the entire sky to a close-up of the Sagittarius starcloud. I enjoyed linking the field of each photo to that of the previous one in the sequence . Thanks, Alan!